Boston has long been a city that builds nonprofit social impact vehicles that are then adopted nationally: Year Up, City Year (now Americorps), Partners in Health, Mass Design Group and many, many more have emerged for over 200 years and continue to come to light in this shining city upon a hill. It often starts with a founder who saw an injustice, had some time or resources to look into it, and got to work. Seven years ago, Sherry Riva discovered a rusty old bipartisan federal housing program, created under former president George H.W. Bush, that allowed people who live in subsidized housing to put wage increases away into a savings account for up to five years, rather than pay increased rent, allowing them to asset build in escrow. 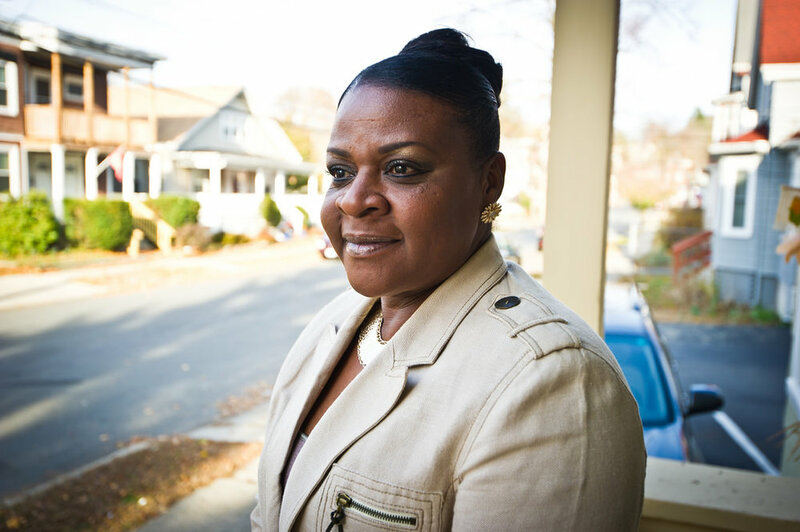 Riva discovered this under-managed vehicle when she set up her own charity in Roxbury and Lynn to help women who needed financial coaching. During one of her coaching sessions, one of her clients explained that she had saved $11,000 through a federal escrow program and then bought a car that broke down. For Riva, a light bulb went off. Today her nonprofit, Compass Working Capital, serves as a private/public partner to over five housing authorities across the nation to help run their Family Self Sufficiency Program (FSS) which offers the escrow program where she and her team coach clients – over 90% women – to reach their dreams of owning a home, send their children to college, and build assets for financial independence. Riva embodies many of the elements of someone who has circled various angles into a problem. Her education at the Harvard Kennedy School and Ecumenical Studies at Trinity College in Ireland offered her the structure to understand how to help those in need, but it was her time in Seattle running the Jubilee Women’s Center shelter where she saw first hand how the cycle of poverty traps families. I sat down with her to learn how Compass Capital is growing at rocket speed, where she sees the role of society in public/private partnership helping those in need, and why asset-building for more Americans is the solution she sees for the complexity of poverty. How did your education lead you to plans for Compass? I finished my Masters in Public Policy (MPP) in 1998, at the Kennedy School after having done a Masters in Ecumenical Studies at Trinity College in Dublin. I was focused primarily around nonprofit management, antipoverty work related to women and families, and domestic violence. I did my master's thesis with the Cambridge Health Alliance on domestic violence, and I think the Kennedy School prepared me in certain ways around macro policy issues and for broader antipoverty work. But the idea for Compass didn't come until I took my first job running a women's shelter in Seattle. What was your role at the women’s shelter and what did you learn? I moved out to Seattle for family reasons and applied to be the executive director at a transitional women's shelter called Jubilee Women's Center. It was a multi-site center that served formerly homeless women who were at risk of being homeless again from a beautiful old convent on Capitol Hill. I was twenty-nine years old and I thought, 'there's no way they're going to hire me for this.' I'd never been an executive director, never managed a board, and I’d been in school for a very long time. I had done antipoverty work and crisis ministry out of Princeton, but I had nothing that prepared me for being an executive director. That shelter work led to Compass. It was at Jubilee where I saw the cycle of poverty that so many women and their families are in and, despite the really important and meaningful work we were doing, many women were still leaving Jubilee and were a paycheck away from being right back on our doorstep. At the shelter, how did you pull back to take this larger view? It's a really interesting question because I don't think that moment happened until I left. I was at Jubilee for about two and a half years before we moved back to Boston. What Jubilee prepared me for was the grittiness of building something. We had started the shelter's first shelter-based technology program for women, and the empowerment piece came easily to me. Jubilee really helped me connect with something deep in my DNA. Spiritually, I come from fundamentally believing in people: in their aspirations, in their dreams, in their dignity and their sacred worth. Jubilee was this gritty situation where the women are living in the shelter. You're up close to it and all I see is beauty and potential. This doesn't mean the work is not hard and there aren't issues that are hard to deal with, but I really hold deep worth in all of the people who are walking through our days, every day, and that was very fundamental to how we thought about what we did at Jubilee and how we delivered those services. How did you move this through to Compass? The idea is that we need to think of poverty not just as an income problem, but as an asset problem. If you only think about poverty as an income problem, your solutions are income-based. We transfer food stamps and housing subsidies and welfare payments, which are things all of us need to meet our daily consumption needs. What many of those programs do is create ‘disincentives’ or ‘asset limits,’ which don't allow you to save while you're receiving those benefits. As a result, we create these poverty traps that make it very, very hard for people to get ahead. If you're a low-income mom living in subsidized housing with very deep desires to work to get ahead, to achieve your dreams for your family, and every time your work success increases, you feel stuck: your rent goes up, you lose your food stamps, and your health insurance goes up. It's not a lack of desire to want to move forward. It's about disincentives that we put in place for low-income families that keep them trapped in poverty. Many attribute the growth of the asset-building movement to a very big thinker in the early 2000s named Michael Sherraden, who wrote Assets and the Poor. He took a really deep look at the role of savings and wealth, and how little our antipoverty programs do to help people build savings as a way out of poverty. That might sound obvious to people I often speak to in financial services communities who are helping higher net worth people build wealth every day, but it's an eye-opening moment to realize that our core anti-poverty programs don't actually apply that approach that helps all of us. Regardless of where we come from, we need assets to do things like buy homes, invest in our children's education, start businesses, and move our families forward. But our anti-poverty programs don't allow for that, they don't invest in people's ability to do that and, in many cases, people are trapped. Who else has trouble getting started with savings? Undocumented people will have difficulty opening a bank account because of the identification that's required, which has become more intense since The Patriot Act. And, if you have ended up in the ChexSystem, meaning you've bounced a couple checks and have been in trouble with the bank, you're put in this national registry and you can't open a bank account until you clear that debt. I didn't learn how to manage my money at home, and that knowledge and teaching depend on where you come from – it's not even about whether you're high income or low income. Your model is the first public/private of its kind in the country. What is novel about your approach to poverty relief? Compass is in the business of supporting low-income families to build assets, savings, and financial capabilities as a way out of poverty. Of our clients, 90% are women. I think that's an important piece. Our core business is bundling financial education, financial coaching, and some kind of asset account to help people move forward. In 2010, we focused very intensely on running a program called the Family Self-Sufficiency Program (FSS.) We're the first nonprofit in the country doing this, and it has been the thing that has caused our growth to feel like a rocket ship. The FSS is a model that lives inside of the federal housing (Section 8). Here is how it works: when you lived in subsidized housing, your rent is tied to your income. If you're in public housing or Section 8 in Cambridge, 30% of your income goes towards a rent payment. That's a policy that was designed to keep housing affordable. It seems reasonable as a policy. The unintended consequence is it has a downward effect on employment for the following reason. When you or I get a raise, we have more money in our pockets. When you're poor, if you earn more your rent goes up, you're probably losing other benefits tied to your income, and the net effect is you cannot get ahead. It is both a reality and perception that ‘work doesn't pay,’ even with an incredibly intense desire to move forward. The FSS, which has been around for 25 years, allows low-income families to capture in a savings account – an escrow account held by the housing authority – any increase in one’s rent that's triggered by an increase in work. It’s a five-year program. It is a brilliant incentive and has had, importantly, very strong bipartisan support. How have you improved it? FSS has been a small program, pretty underutilized, and run by housing authorities, who are generally not in the economic mobility business – the business I’ve created with Compass. Early on before I created this model, I was coaching ten families in Roxbury and then expanded to Lynn. I was coaching a woman who was a dental assistant probably making $19,000 a year, and she told me she had gotten a check from her housing authority the prior year for maybe $11,000 through this federal housing program, the FSS. As her financial coach, I asked, ‘where did that money come from?’ and ‘what did you do with it?’ The reason I tell you that story is because it is consistent with what we always do at Compass, which is we start by listening to our clients and, in this case, mostly women living in poverty. When she graduated from the FSS program, she was given her $11,000 and a year later she couldn't quite remember where the money had gone. She was fantastic, hardworking, as are all of our clients are. The miss was she had gotten this $11,000 check without a lot of coaching or preparation of what to do with it. The light bulb moment for me was that the FSS was a scalable model for us to do what we're really good at, which is one-on-one financial coaching and savings for low-income families. Can people reenroll after their first five years in FSS? It depends on your community but generally, yes, you can re-enroll. In order to graduate and get the savings, clients have to be working. They have to have made progress towards their goals and no one in the house can be on cash welfare. I approached the housing authority about a year later to ask that if I could raise the money, would they let me run their FSS program in Lynn. I went to Joanna Jacobson at Strategic Grant Partners (SGP), who made a big investment in our work, and I said, ‘I think this is a scalable asset-building model for low-income people who live in subsidized housing.’ There are five million people nationwide in subsidized housing and about two million of those are working families. We said that we wanted to develop and test a kind of new, reimagined FSS that's focused on integrating financial coaching, personal finance, and this asset-building lens into the existing housing program which for the most part was kind of chugging along but didn't have really high participation rates around the country. While the outcome data was good in some places, we felt like we could deliver better outcomes. We believe families want to work, want to get ahead, and deserve access to more economic opportunity; this was a lever we could pull on to do that more broadly. In which towns and cities are you now running their FSS? We started with Lynn and within 18 months had quadrupled the size of the program. Then we went to Cambridge where we are running a really interesting program with their Housing Authority. Then we came to Boston. Subsidized housing exists in every big and small city in the country, so we started to get a lot of inbound calls from other cities asking Compass to run their FSS program. Can you believe this all began by meeting with some women in Lynn? It’s amazing. I hired back a woman named Sandra Suarez who had graduated from one of our earlier programs, and together we held a house party in her home in Lynn, which she had bought through our savings program. Sandra's family is from Puerto Rico, and she made this beautiful meal and the two of us were sitting there on a very hot summer night in Lynn. We had done all this outreach in Lynn to people who lived in subsidized housing and had no idea if anyone would walk through the door. The first woman walked in and then about twelve women, mostly Latina, came in and asked, ‘what's this program?’ It was an awesome moment, reflecting where we started. We asked about the dreams of everybody in the room and without exception, the top two savings goals were always saving for your own home and saving for your children. I have three girls of my own. I love doing this work as a young mother because I am working with other mothers who have the same dreams and aspirations for their kids as I do for my own. I love that piece of it. Most of the women who came that night ended up enrolling in the program and we built it up like that in Lynn. The results were so good and the majority of our early graduates actually made a positive exit out of subsidized housing which, by the way, is a very hard thing to do. What is the 'private' in public/private partnership between you and the Housing Authority? We’re the first nonprofit running this federal housing program called the Family Self-Sufficiency Program. That's the public/private piece. Do these clients have to pay you a share of their earnings? No. We’re a nonprofit and it's a partnership between a public housing authority and our nonprofit. That's what we mean by public/private. Is there any financial gain by Compass Capital or the housing authority for the savings? Not between the client and the program or us. The public housing authority now passes through the money they get from HUD to us to run the program, and then we raise philanthropy to grow it even further. When we first went to Lynn, it was all funded by philanthropy. As the program grew, Lynn passed through part of its coordinator grant, but it wasn’t enough. Philanthropy allows us to serve the demand. Instead of saying, ‘we can only serve fifty people because our federal grant only allows us to do that,’ I've made a commitment to the families and to my team that we want to serve people who are raising their hands, and we work hard to ensure that. If you have more demand and more people want to opt into this program, will you be able to keep it funded? HUD has about $75 million for the Family Self-Sufficiency Program that it distributes to housing authorities all over the country. It’s a tiny national budget. How many people work at Compass today? We’re close to 30 and about a $4 million nonprofit organization, but two years ago we were only six or seven people with a $1.5 million budget. Today, we serve 1,500 families. We're in six different cities and probably going to four more by the end of the year. We’ve been doubling in size, year after year. Our growth strategy is important because we took some time to look at what made sense, and launched a national network in the fall of 2016 where we are providing training and technical assistance (TA) to mission-aligned partners all around the country. We now have a partner in Jackson Mississippi, a terrific non-profit organization, that works with low-income families in subsidized housing and we are providing training and TA for them on how to build an asset-building model for the FSS program to help the residents of their developments. How are you funding this work with partners in other cities? We were given a $1.3 million grant from the Kellogg Foundation that helped us launch. Our partners pay us a small license fee depending upon their size, and that partner could be a housing authority or a nonprofit working with the housing authority. We are now in Jackson (Mississippi), Portland (Maine), and Independence (Missouri). We are going to Chicago, about to sign with the state of Rhode Island, and competing for a partnership in Philadelphia. I think the role that philanthropy can play that's so powerful is providing that seed funding that allows us to build the infrastructure here so that we can provide training and TA with the idea being that at scale that model might get close to sustainable if we're working with dozens or hundreds of partners around the country. Is your goal to eventually get it to a self-sustaining model? Yes, and that's what we're trying to figure out. What’s amazing for me is that I had the privilege to visit Jackson, Mississippi, for example, which is so different than Boston in so many ways. When you listen to the stories, the struggles, the challenges, the dreams of the families there, so much is the same. The common thread is that families want to work. They want to get ahead and we need to do more to invest in their ability to do that. There are a lot of structural and systemic barriers that we're uncovering about what makes it harder for women, for people of color, to build wealth in this country. The gender wealth gap is big. The racial wealth gap is big. We're doing more policy work now, especially in the climate that we find ourselves, and the FSS program has always had really strong bipartisan support. I feel like we're holding this precious opportunity, regardless of where you sit politically. What policy would you change? We want to see asset building integrated into the very fabric of how we deliver housing and other anti-poverty assistance. The FSS program is a national program where we estimate only 3% to 5% of eligible people participate. That is tiny. Instead, it could be integrated into the delivery of housing assistance. We see potential aspiration, drive, and work ethic in every family who walks in here. But instead, we have created these large welfare and housing systems in America that don't do enough to see and invest in people's desire and ability to move forward. We estimate that there are two million households nationwide that could benefit from this model, and they deserve access to the same opportunities to advance their families economically. Our growth model is this training and TA model, and the challenge for us is doing it at scale. Right now we are looking at making investments in technology; how do we do virtual or remote coaching better? How can technology not replace coaching, but enable some piece of it so that we can serve more people? And eventually, the goal would be not to limit ourselves only to people who live in subsidized housing but to say, look, asset building is a big anti-poverty idea. Where can we integrate this financial coaching and asset building lens into other markets that serve low-income people? I want to make sure I make this point clearly – poverty is complex. The solutions to it are complex. There's urgency around giving more families access to the opportunities that they deserve. That's the piece that I think is really innovative about our work, and very important to unpack. It’s about really looking at the role of helping people build assets as a pathway out of poverty. Where do you go to take in Boston? One place I love is Jamaica Pond. I went for a run around there the other day and, this may be old school, but I still really love the Boston Common and the park, but that might be more personal. I was just walking through there the other day. Any favorite haunts in Brookline? I love Brookline. I'm part Italian so I love La Morra. It's my favorite Italian restaurant. I love it and Barcelona, although it's impossible to get in. I just love Italian food.